John and Leigh Ann Wilson fought to get treatment for their heroin-addicted daughter, said journalist Max Blau. But in a town where one in four residents is hooked on opioids, the odds were stacked against them. THE WHITE CAR had stopped in the middle of the highway. The driver was slumped behind the wheel, her breaths faint and few. Her head was bobbing, chin to chest; her pupils were the size of pinpoints. The car was strewn with syringes. Paramedics inserted a needle of naloxone, an opioid antidote, into her left arm—the one with fewer scars. A minute passed. Two. At last, Taylor Wilson’s eyes flickered open. Taylor’s overdose was the first of 28 that would be reported in Huntington, W. Va., a small city on the Ohio River, in the span of five hours on Aug. 15, 2016. Frantic calls flooded in to 911: Heroin users were passed out on dining room floors and in convenience store bathrooms. “People are coming here and dying,” one caller said. The horror of that afternoon made national news: CNN, Fox News, the Associated Press. As longtime health-care professionals, the Wilsons thought they knew how to navigate the system. Leigh Ann had worked for years as a paramedic before becoming a home health worker; John was the lead residential therapist at an Ohio facility for troubled adolescent boys. They both had a sense of the hard road ahead. On the 42nd, a beautiful Sunday in late September, Taylor overdosed again. This time, no one was able to call 911 in time. Here in Huntington, population 49,000, health officials estimate a staggering one in four residents is dependent on opioids, from squalling newborns shaking with withdrawal symptoms to powerful law- yers immobilized by addiction. It’s so bad that the mayor carries around a naloxone injector in case he encounters an overdose victim. The city has tried setting up a needle exchange, hiring a drug czar, even suing the drug companies that brought pain pills to the state. None of those tactics has stopped the epidemic. Her dad had found her after her first, in the summer of 2015. He’d heard a loud thump in the lower level of his house. Taylor was unconscious. After her second, in March of last year, Leigh Ann had received an anonymous call saying Taylor had recently entered cardiac arrest and almost died. Leigh Ann placed Taylor on leave from her college classes at Marshall University in Huntington and her job at the Wendy’s drive-through window. 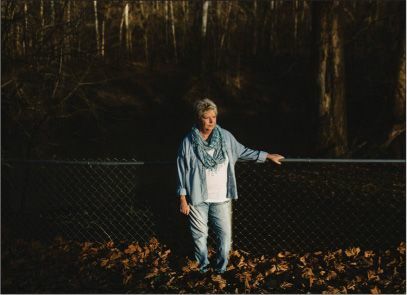 She made countless calls before she found a bed at Karen’s Place, an all-women’s Christian treatment center just across the Kentucky state line. The Wilsons scraped together $4,000 for a 28-day inpatient program that included counseling, spiritual mentoring, and Narcotics Anonymous meetings. With 12 days left, Taylor checked herself out. She soon got back together with her boyfriend, who had a long rap sheet of drug offenses and was also addicted. The following month, Taylor turned 21. She celebrated her birthday with a new hairdo, paid for by her mother—and later that day, with heroin. Her addiction, like so many others, had started with prescription pain pills. But as lawmakers cracked down on pill mills, drug users across West Virginia and the nation turned to heroin. Taylor did, too. It was more convenient to get, and often cheaper. It was also more deadly, especially when spiked with synthetic opioids like fentanyl or an elephant tranquilizer known as carfentanil, so potent that a dose the size of two salt grains could kill. Spiked batches of heroin had the potential to ravage a whole town. One day last summer, there were 17 overdoses in Akron, Ohio. Another day, there were 10 in Columbus. The cluster in Huntington was one of the worst. Two of the 28 drug users who overdosed on that day died. And many who survived got no treatment beyond the jolt of naloxone to revive them. That’s a familiar problem. West Virginia officials estimate 150,000 residents—8 percent of the state’s population—needed substance abuse treatment in 2016. Just a fifth of them received help from treatment providers belonging to the state’s top behavioral health association. And only 156 detox beds were available across the entire state. After her third overdose, when her car stopped in the middle of traffic, Taylor called her mom from St. Mary’s Medical Center. The paramedics had brought her there, and she needed a ride home. At wit’s end, Leigh Ann asked John if they should commit Taylor involuntarily to a psychiatric hospital using a legal document known as a mental hygiene order. John knew such an order would have repercussions; their daughter could lose her ability to own a gun or hold government jobs requiring security clearance. But Leigh Ann reasoned that such consequences wouldn’t matter if they had to bury Taylor. Before dawn on Aug. 16, a police officer transported Taylor in handcuffs to Charleston’s Highland Hospital for detox. The lead psychiatrist there diagnosed her with addiction and depression. Highland’s psychiatrist, however, decided Taylor should be released after seven days with a recommendation for outpatient counseling. That isn’t uncommon: It’s hard to get insurers to pay for more than a week to 10 days of inpatient treatment. Days after her discharge, Taylor received even more bad news: She had contracted hepatitis C, likely as the result of sharing needles with her boyfriend. It could be treated, but she’d have to stay away from needles. She believed medicationassisted treatment was necessary to help her withstand withdrawals. “It’s the only way I’ll make it,” Taylor told her mother. Taylor put her name on Prestera’s waiting list for Suboxone, an opioid-based drug that reduces withdrawal symptoms. No one told her how long she might have to wait, but she’d heard it could be months. Taylor had agreed that while waiting for treatment she would live at her father’s house. She had two conditions: access to library books and the ability to write to her friend John Stiltner II, a recovering heroin addict who’d sent her a letter during her hospital stay. John Wilson had strict rules— no computer, no cellphone, and no car—but agreed to those conditions if he could read Taylor’s letters before she mailed them. In late August, John decided to keep his long-standing plans for a vacation. He couldn’t trust Taylor at home alone, so he asked her to stay with her mother. At her mom’s house, Taylor kept her head down in World War II books. And she kept in touch with Stiltner through letters and text messages on a phone she had managed to keep hidden from her dad. Taylor started attending N.A. meetings three times a week and looking for a soberliving apartment. But the meetings did only so much as her life grew more stressful. Taylor had helped identify the Ohio dealer who allegedly sold her heroin on the day she overdosed. It was that same batch of drugs, apparently spiked with synthetic opioids, that had killed two people and sent 25 others to the brink of death on that August day. Taylor was expected to testify against the dealer later in the month; if she failed to show up, she could end up in jail. Leigh Ann tried to get Taylor inpatient treatment. Taylor dialed down a list of nearly three dozen treatment centers. Time and again, she got either voicemail or receptionists saying they were full for the day. Try again tomorrow, they said. TAYLOR SPENT HER third week in September waiting for her court appearance. After her testimony, she seemed herself, gushing to her mom about a cute detective. In that moment, Leigh Ann thought everything might be fine, so long as treatment arrived in time. As the week drew to a close, Taylor asked her mom for her car keys. “Where are you going?” Leigh Ann asked. “An N.A. meeting,” Taylor replied. Leigh Ann wasn’t sure she believed her, but she wasn’t feeling well, so she didn’t put up a fight. Taylor headed out around 6 p.m. to pick up her friend John Stiltner. There was indeed an N.A. meeting, and they attended; John even texted Leigh Ann to let her know. After the meeting, John and Taylor cruised Huntington’s back streets. Past the nickel plant, Taylor pulled over at a stop sign. They waited. John had earlier noticed Taylor on the phone. Now a dealer approached Taylor’s car. It was a quick exchange: She pulled out $80 and the dealer gave her a half-gram of what looked like heroin. “What the f--- are you doing?” John asked. John demanded to be taken home. Once Taylor dropped him off, he made a point of not texting her all night, hoping to teach her a lesson. Night had fallen by the time Taylor walked into the house. She snacked on some Kroger barbecued chicken on the blue couch in the lower level. Leigh Ann walked downstairs before 11 p.m. to find Taylor watching TV. As Leigh Ann woke up on Sunday, she noticed the TV’s hum. It sounded like Taylor had left it on all night. So she went to check. Taylor was slumped on the blue couch, motionless. Her skin was cold as ice. The autopsy would later conclude that Taylor had died of an overdose of opioids: fentanyl, carfentanil, furanylfentanyl, morphine, and hydrocodone. But no heroin. Before she left home, Leigh Ann’s cellphone rang. The voice on the other end, full of excitement, had good news. Taylor had cleared the Suboxone waiting list.